These are some pictures I’ve taken and observations I’ve made in recent days. I took some of the pictures for this post from a Stratford to Bishops Stortford train. Whilst waiting in Platform 11 at Stratford, a Class 321 train, ran past my train and through Platform 12. It could have just been an empty stock movement from Orient Way Sidings to Liverpool Street. Or was it going round the High Meads Loop, possibly for driver training? Work has been progressing on this section, as these pictures show. Track is starting to be laid, but there is no evidence of the points, where the three tracks will merge into two. Work has been progressing here too! This Google Map shows Coppermill Junction. Note there is a lot of space on the Chingford side of the junction. Could Network Rail be reinstating the Coppermill and Hall Farm Chords? Or at least creating the space to do it? I wrote about these chords in Rumours Of Curves In Walthamstow. Nothing has been published or said, but there’s an awful lot of work going on to just add a third-track between Meridian Water and Lea Bridge stations. An island platform is emerging at Tottenham Hale station. The current platforms are as follows. 2 – Northbound to Bishops Stortford,Cambridge, Hertford East and Stansted Airport. This map from carto.metro.free.fr shows the new layout. Blue is the Victoria Line. So it looks like an extra Platform 0 is to be added on the new track, which will be an island platform with Platform 1. These pictures show the current works. It looks to me, that there is a surprising amount of space and it might be possible to squeeze two tracks in the space. All the track is now down and overhead wiring is in place. It is definitely bi directional as there is an double ended AWS ramp under the bridge carrying the Chingford line Looking at the rails, it doesn’t look as if it is in use yet. 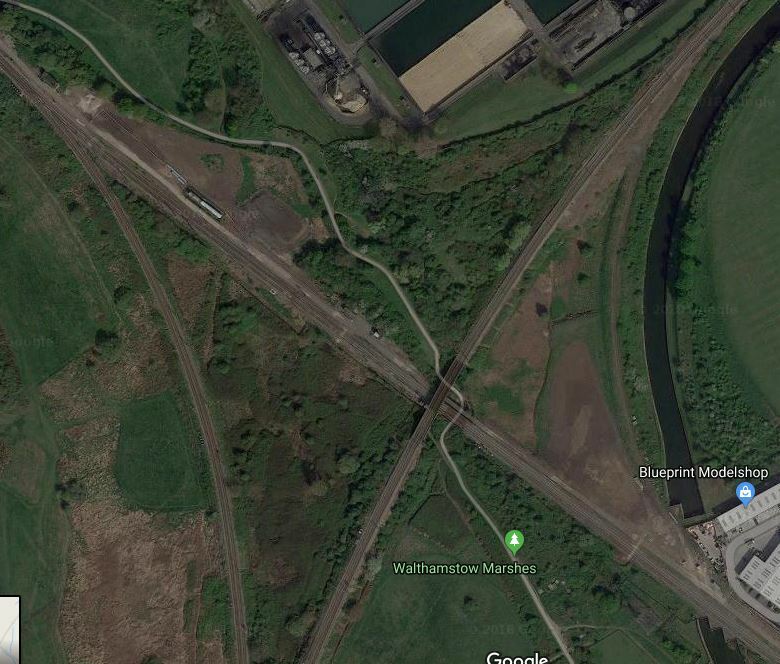 Also, there are what look like earth abutments which would allow a new Coppermill Curve to cross over the footpath that now runs to the east of the line from Lea Bridge but as far as I could see, no evidence in the trackwork or the overhead wiring to provide for a junction. Very puzzling. I also managed to track down the line of the original Coppermill curve by using the satellite view in Google maps (which shows it clearly) and blue blob to tell me where I was. It is further north than I thought and actually runs just inside the fencing for the filter beds which I think were built after the line was taken out. Thanks for that! I have been told by someone who should know, that the Coppermill Curve and the Hall Farm Curve will be reinstated. Have just found your posts about STAR – so now understand what the new bidirectional line is for. I saw somewhere in there that they may put in a grade separated junction at Coppermill for the Clapton curve and did wonder whether those abutments were for that – but they are pointing in the wrong direction.. If they do built a flyover, then i think it will face a lot of opposition as if it is on the same scale as the flyover for the Hitchin to Cambridge curve, it will take our a chunk of Walthamstow Marshes which are fiercely protected by those who use them (which includes me). They are also important SSSIs. Thanks for some very interesting posts.